I didn’t make a pie post last week, because I remade a pie I’d made before — this Peach Blueberry Pie. It turned out better this time around, I think, although there were the usual issues. I made sure to completely thaw the peaches this time, so they’d cook through, but it turned out that thawing them made a LOT of extra liquid in the filling mix. I was afraid it wouldn’t set up, so I ended up scooping out the peaches and blueberries and putting them in with a minimum of liquid. It worked, in that the pie cooked and the filling wasn’t running all over the place, but it also wasn’t as sweet as last time, so not quite as tasty in my book. Also, while I was working on the lattice top, Little Miss Sunshine was upstairs decidedly NOT napping. So I was putting down a strip of lattice, then going to the bottom of the stairs to tell the Little Miss to get back in bed, then doing two more strips of lattice, then going upstairs to put her back in the bed, then doing another strip of lattice, then yelling at her to just come down already, and as a result, I put the pie in the oven when the lattice was only half done. OOPS. I know this is a minor thing and really not a big deal at all but for some reason I was kind of upset about it so I didn’t even take a photo. PMS, I’m thinking. So, on to this week! 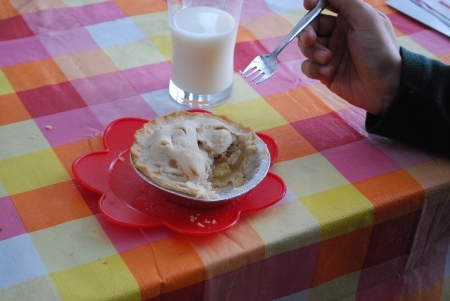 This week I am trying something new – miniature pies. This is a throwback to my youth, when my mother would make enough pastry dough for three or four pies at a time, and use the leftovers to make a small pie, the size of a meat pie. My sisters and I used to fight over the mini-pie, so eventually my mom started to make one miniature pie for each of us. Then she’d put the pie in our school lunch bag for the next day, and all the kids and teachers would drool as we ate a whole pie. I started with the pastry. I had no idea how much to make. I ended up making enough for four single crusts (4 cups cake and pastry flour, 1 1/3 cups shortening, 1 teaspoon salt, just less than 8 tablespoons water), but that was more than enough for the five pies I was planning on. I could easily have made at least seven, maybe eight if I rolled the pastry out thin. Although the pastry rolled out well, working it into the cups was very fiddly, and round about now I was cursing this idea and thinking this had no chance of working. Plus I kind of wrecked my knee doing Wii Fit Rhythm Kung Fu (I rock, I challenge YOU ALL), and I was getting annoyed at how long it I had to stand there trying to whip the pastry into submission. 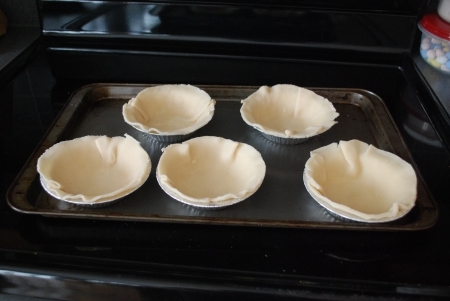 Tip, if you’re going to make these: don’t bother to preheat the oven until the pastry is rolled and cut. Otherwise, your oven will be twiddling its thumbs and wondering why you never did buy it that iPhone you promised so it could text all its other oven friends while waiting FOREVER for your stupid pies. Trust me. Then I made up some fillings. I cannot believe how casual I was with these fillings, people. I am the ultimate in follow the recipe, I must know the exact amounts of everything. Don’t be giving me no recipes where you throw in a little of this and a blob of that. NO. I need numbers, and details, and hand-holding all the way. But for these, I just kind of threw some things in a bowl. I KNOW. I went nuts! 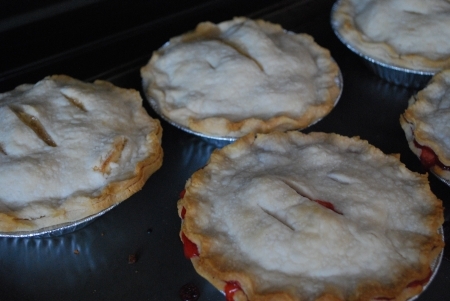 Three pies are apple – I used one apple per mini-pie. Then I added around 1/4 cup sugar (to the three apples, peeled and cut into very small cubes), a couple teaspoon-sized scoops of flour, and a generous sprinkle of cinnamon. 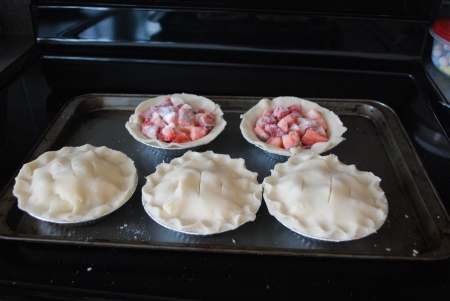 The other two pies are strawberry – I used around 2 cups of chopped up strawberries with 1/4 cup sugar, a heaping tablespoon of flour, and a very small sprinkle of cinnamon. By this time my hair was grey, I’d lost all my teeth, and had two hip replacements. FIDDLY. I baked them at 375 for 40 minutes, although I could have taken them out five minutes earlier, I think. Very important to rotate the pies around in the oven a few times, and also to bake them on a cookie sheet for your own sanity. They came out looking pretty good, actually. I took two pictures because in the first one, they just look like a bunch of normal sized pies, don’t you think? So I stuck my hand in there for sizing. They are so good. Amazing. The best pies I’ve ever made. I can’t even decide which I like better. The strawberry is like a giant candy. The apple is exactly like the ones I had in my lunches as a child. I’m so very, very happy right now. This weekend I’ll be seeing my mom and she’ll be making pies. Hopefully I can learn something, but at the very least I think I can stand beside her in the kitchen and maybe even (gasp!) help. The piemaker dream lives! It’s ALIVE!! i so totally take you up on the Wii Rhythym Kung Fu challenge! HaaYeahh! Those pies look truely delicious. and what is better than being able to say that you ate en ENTIRE pie! so decadent. yeah you! Great post and totally want a scratch-and-sniff monitor for my computer. Multiple yums! Looks like a sucessful mini pie experiment, even if you oven was twiddling it’s thumbs wishing it had an iphone waiting (tea-snorting laughing at that one!). 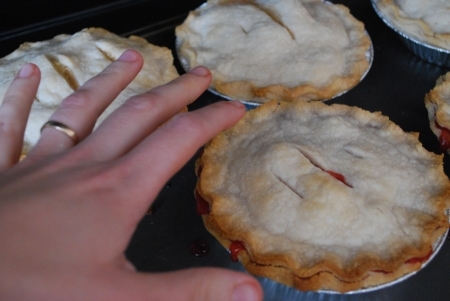 Congrats on your winging it with the fillings and having success – the sign of a great pie master. You make me want to bake. Funny, it doesn’t make ME want to bake at all :). Anything’s better mini, I say. Those are freakin’ adorable. Great looking pies. My Mom used to do the same thing. I had forgotten about that. Thanks for the memories. Those look soooooooo good. ‘Specially the strawberry pie. Good for you not following a recipe for the filling. Wasn’t that fun? Didn’t it feel liberating? I too used to follow recipes religiously, but now I often make things up on the spur of the moment or do some hodge podge of three different recipes, plus add in a couple of ideas of my own. The only downside is that sometimes I make something that turns out fabulous, but I can’t remember how I made it. Have a wonderful Easter weekend, Lynn! You are totally making me want to try this pie making thing. I have never mastered the crust and I am thinking that it will be a project for this fall when the baby is napping regularly! Those pies look amazing and I might just have to insist that you invite D2 and me over for a morning tea and pie session soon!! !